The purpose of the stdtable command is to describe the association between two categorical variables nett of the association imposed on the table by the marginal distributions or make cross-tabulations comparable across groups by removing differences due to differences in the marginal distributions. The stdtable command does that by standardizing a cross-tabulation by fixing the row and column totals. 1.  source: Featherman, D.L. and R.M. Hauser (1978) Opportunity and change. These standardized counts can be interpreted as the row and column percentages that would occur if for both fathers and sons each occupation was equally likely. It appears that the apparent asymmetry was almost entirely due to changes in the marginal distributions. Also, it is now much clearer that farming is much more persistent over generations than the other occupations. This table shows the counts that would have occurred when the odds ratios (effects) are the same as in the data, but the row and column totals were all 100. By setting the row and column totals to all the same number we filter out the effect of the marginal distribution. Setting the row and column totals to a 100 works when we have the same number of rows and columns. If the number of rows and columns differ then the total sample size implied by summing the row totals would not match the total sample size when summing the column totals. In that case the default margins will the 100 / (number of columns) for the column totals and 100 / (number of rows) for row totals. These standardized counts can be interpreted as the cell percentages that would have occurred if each category was equally likely to occur. Standardizing tables can also be useful to compare tables with different marginal distributions. 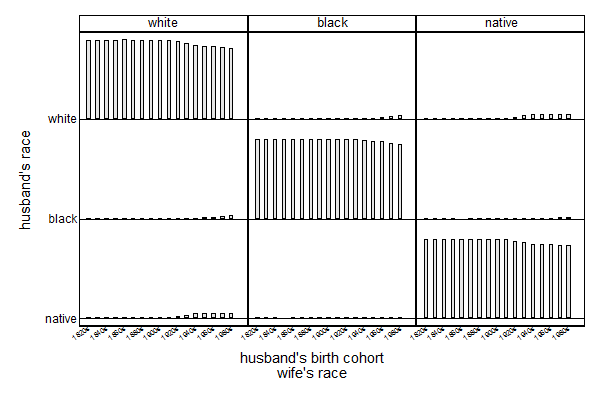 In the example below we look at the race of husbands and wives in the USA for married couples whose husbands were born born between 1821 and 1989 using the 1880 till 2000 censuses and the 2001 till 2014 American Comunity Surveys. We can see that the racial boundaries have become a bit more permeable over time, but that the USA is still very far removed from being a melting pot. [Machine-readable database]. Minneapolis: University of Minnesota, 2015. The standardized table can be left in memory using the replace option, which can be useful for graphing that table. Nick Cox's tabplot is nice for this. Setting all the row and column totals to a 100 is nice for filtering out the effect for filtering out the effect of the marginal distributions, but is unrealistic. If we just want to filter out the effects of changes in the marginal distributions over time, we could fix all the margins to be equal to the margins of one cohort, say 1980. Agresti, A. (2002) Categorical Data Analysis, second edition. Hoboken: Wiley Interscience. Featherman, D.L. and R.M. Hauser (1978) Opportunity and Change. New York: Academic. Mosteller, F. (1968) Association and estimation in contingency tables, Journal of the American Statistical Association, 63(321): 1-28. Yule, U. (1912) On the methods of measuring association between two attributes, Journal of the Royal Statistical Society, 75(6): 579-652.